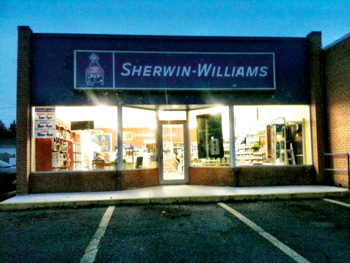 Sherwin-Williams Protective and Marine Coatings has launched a trio of next-generation polyaspartic urethanes combining high throughput, superior appearance and durability with ease of workability for applicators in one protective coating line. EnviroLastic 840 DTM, 940 DTM and 980 PA address the most common challenges facing shop and field coating contractors, with each system suited to varying conditions. According to Bodapati, because few factors have a greater impact on productivity than the speed of drying and the number of coats required for exterior coating applications, the EnviroLastic line’s performance foundation is high throughput. EnviroLastic 840 DTM is a thin film direct-to-metal shop coating that dries to the touch in 20 minutes, virtually eliminating grit pickup; tolerates exposure to dew and precipitation; and has a distinctness-of-image factor that reflects a mirror-like appearance in the high-gloss finish coat. Its uses include high throughput shop applications including frac tanks, production equipment, structural steel, rail cars and sign structures. EnviroLastic 940 DTM is a high-build direct-to-metal coating with superior gloss and color retention. The early moisture-tolerant coating delivers epoxy-polyurethane performance in just one coat, and can be applied in temperatures as low as 35 F and at significantly lower applied cost than a conventional two-coat system. Its uses include bridge projects, production tanks, steel fabrication, other structural steel, commercial and architectural applications. EnviroLastic 980 PA is a premium, high build finish coat with long lasting durability and corrosion protection. Over a zinc-rich primer, performance requirements can be readily achieved without the intermediate coat that has been the industry standard for decades. The coating dries to touch in 30 minutes, virtually eliminating grit and dust pick up; can be put into service in two days; and has an extended three-month recoat window. Together these features are the answer to coating applicators’ dreams on large maintenance projects where productivity is prized and rewarded. Its uses include bridges, stadiums and other high-visibility structures, as well as plant, refinery and offshore equipment and piping. 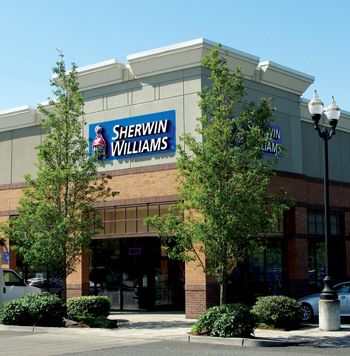 Sherwin-Williams is a global protective and marine coatings company that delivers smarter asset protection and unmatched service and specification support to its customers from 4,000 locations worldwide. From alkyds to zincs, the company offers a complete line of time-tested, high performance coatings and systems to combat corrosion, supported by the largest group of NACE-certified coatings inspectors in the industry. It boasts more than 140 years in business and a culture of product innovation. In other recent company news, Sherwin-Williams Protective & Marine Coatings launched an oil and gas app to provide users with protective coatings recommendations best suited to extend the lifecycle of assets in refineries and shale drilling sites, such as frac tanks, pipelines, cooling towers and rail tank cars. The app is optimised for both iOS and Android.